Badami Things to do - Badami, often referred as the "Cradle of Architecture of South India," is a beautiful place to be included in your "To do list in India". It is located on the banks of River Malprabha, in Bagalkot District of Karnataka, in the southern area of India. 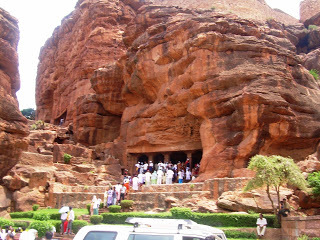 Often people do not know what is to be done in Badami other than visiting the red stone cave temples. This list will help you to know about the things you can do in this beautiful place. 1. Enjoy the rare beauty of the cave temples, a series of four rock-cut cave temples, carved out of a hill. You can climb up to the hills and visit each temple and enjoy the exotic beauty. 2. Visit the Archaeological Museum at Badami, located at the northern side of the Agasthya lake. 3. Visit Badami Fort perched on hill top about 2 km. from the town, and enjoy the carved temple there raised on top of the northern end of the hill. 4. Visit Banashankari temple, 5 kms away from the town, located at Cholachagudd, built in Dravidian style. The temple is popularly called Banashankari or Vanashankari since it is located in the Tilakaaranya forest. The deity is called Shakambhari, an incarnation of Goddess Parvati. The temple celebrates its annual festival called Banashankari jatre, in the months of January or February. 5. Visit Naganath Temple which is one of the ancient Chalukyan temples dedicated to Lord Shiva, located 10 kms away. 6. Visit the ancient Mahakuteshwara temple of Lord Shiva, located 14 kms away from Badami. Relax by the natural spring pond called Vishnu Pushkarni. This temple is an ancient temple (built in 6th-8th century), by Chaukyas. Mahakuta group of temples has various historical inscriptions over it which tell a lot about the history of the place and religion. The inscriptions on the pillar depict the history of Chalukya dynasty. 7. Visit the UNESCO World Heritage site of temples at Pattadakkal, constructed in 7th and 8th centuries, built by Chalukyas, located 29 kms away. These magnificent temples are built depicting a marvelous blend of north and south Indian architecture. 8. Visit the marvelous temples at Aihole, 45 kms away from Badami, built during sixth to eighth centuries, by Chalukyas. 9. View Augustya lake with emerald water surrounding Badami caves and take a stroll if you can.